In the process of cleaning my diet up even more this past year I have come across how unhealthy some common everyday products are. So many unassuming foods contain unnecessary, toxic ingredients. My target today is your regular stock cubes/pots. Homemade stock contains a plethora of beneficial properties, whereas stock cubes and pots don’t contain anything beneficial. The only benefit they have is convenience, but its so easy to make your own stock once you know how, and its much more rewarding! Whether its chicken, pork, beef, fish or vegetable, broth is one of the most nutrient dense ingredients and it can be used as the foundation for stews, soups and even used to boil your rice and other grains. Im an advocate of reducing waste wherever possible, especially if something has been killed to be eaten, and the bones are packed full of goodness that usually goes to waste. Chances are if your reading this then your probably interested in healthy eating. If thats the case then tune in to Channel 4 tonight at 2000hrs (Monday 9th May). Its a program called Eating Well With Hemsley + Hemsley, and its where I get a lot of my foodspiration! Firstly lets look at what goes into stock cubes/pots. The first ingredients are salt and sugar, not a good start. Yeast extract, wheat flour, GMO maize starch, barley extract, palm oil and other trans fat loaded vegetable oils, gelling agents, potassium sorbate, MSG, disodium guanylate, ammonia caramel, maltodextrin and potassium chloride. Non of this stuff sounds like food and thats because it isn’t, and these ingredients have so many health risks. There are too many to list, however I covered how toxic MSG is alone in a recent post about Nutella,which you can find here. Its not hard to quickly search on Google to find out how harmful and pointless these ‘ingredients’ are, or just ask me if you have any questions. There are some healthier options available in most good supermarkets and some health food shops. However, nothing beats the real deal. 1. Heals the gut. It contains gelatin which protects and heals the mucosal lining of the digestive tract and helps aid in the digestion of nutrients. 2. Fights infections. Bone broth, especially chicken broth strengthens the immune system. So there is method behind the madness of having chicken soup when you’re ill, as long as its home made! Glucosamine in bone broth can actually stimulate the growth of new collagen, repair damaged joints and reduce pain and inflammation. 4. Benefits skin, hair and nails. One for the ladies (or anyone that wants healthy skin, hair and nails)! The collagen and gelatin in bone broth supports hair growth and helps to keep your nails strong. Much better than a pot of pills. 5. Helps with bone formation, growth and repair. The calcium, magnesium and phosphorus in bone broth helps our bones to grow and repair. 6. Easy to make. Throw all of the ingredients into the slow cooker or large pan and it cooks while you sleep. 7. Higher quality than supplements. 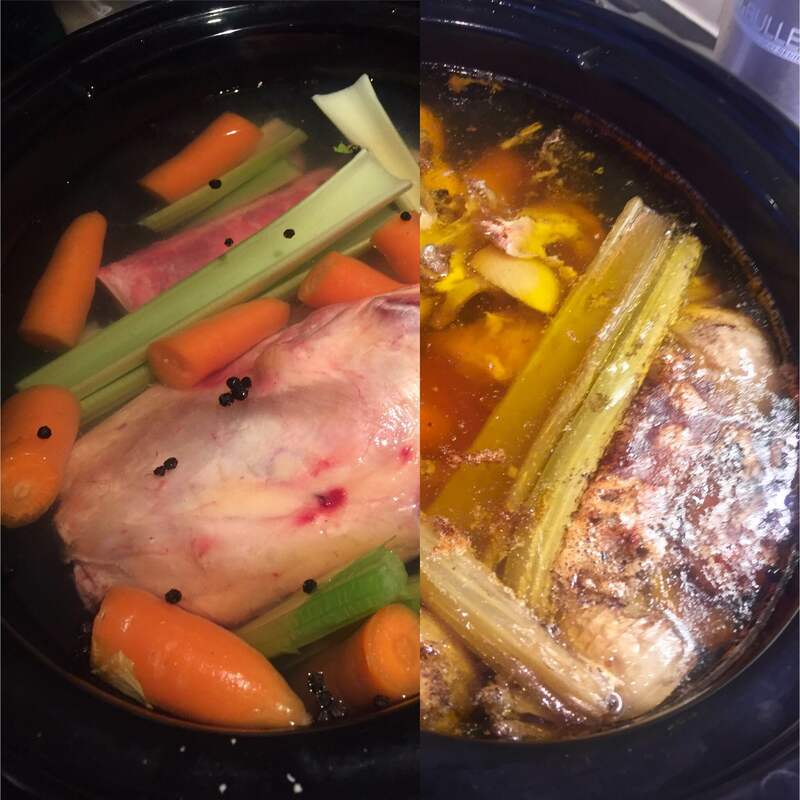 Homemade bone broth, made with high quality bones, contains all the nutrients and minerals found in the bones and tendons. Compared to the lesser quantity and quality found in pills. Slow cooking preserves the nutrients better than the high heat extraction used to make supplements. 8. Fights inflammation. Bone broth is very high in glycine and proline which are anti-inflammatory amino acids. 9. Promotes sleep and calms the mind. Glycine can also be very calming. 10. Contains iodine. Bone broth made with fish bones and heads contains iodine and can help strengthen the thyroid. Your stock is only as good as the ingredients you use, so always use organic when possible. Its best to use a slow cooker as it can cook while you sleep or while you’re at work, but it can still be cooked in a pan, with a lid and at a low heat. Once its cooked simply separate the fluid from the bits using a sieve or a muslin cloth. Refrigerate for a week or freeze and use whenever you want. Beef stock contains a lot of benefital fat. Once the stock has settled and separated you can skim the top off and use it in cooking. I get my bones from a good local butcher and use the chicken caracas left over from a Sunday roast. It may take a little longer to collect enough fish or chicken bones so its a great idea to freeze them until you have enough. So, here is how you can make this nutritious superfood. Chicken broth is a great immune system booster. Throw all the ingredients into a slow cooker, cover with water and cook for 8-12 hours. Or on a very low heat in a pan for at least 5 hours. The longer its cooked the more nutrients that will be released from the bones. Fish broth is the most nutrient dense, easiest and potentially cheapest. When using flat fish bones then cover with water and simmer in a pan for 30-40 minutes. For fish like cod and bass cook it for at least 5 hours. Beef broth is full with glucosamine and chondroitin, which helps keep your joints mobile and strong. Throw all the ingredients into a slow cooker, cover with water and cook for 8-12 hours. Or on a very low heat on the hob for at least 5 hours. Chop the ingredients into small chunks and put them all in a pan. Cover with water and simmer all the ingredients for 20-30 minutes.